Sell Your Home As Is? There is a belief that selling your Florida home “AS-IS” somehow relieves you, the owner, from the obligation to disclose any known defects. Nothing could be further from the truth! Regardless of selling “as-is” or not, as the seller you are required to disclose any known defects about the property which also includes any liens or other issues that negatively affect the property. Selling as-is might be picked up by buyers that there is something wrong with the home and being offered at a discount. In my experiences, buyers quite often wonder what is wrong or what are they trying to hide. Even if the property was and investment or you never occupied the property, this does not require you to sell as-is. Disclose what you know and you should be good without having to raise the "as-is" warning flag to the buyers in the market. There are two contracts provided by the Florida Association of Realtors for use by its members. One, titled the Residential Contract for Sale and Purchase (Call Standard for lack of a better term) and the AS-IS contract. While the as-is contract might seem a better choice because it provides no commitment by you, the seller to make any repairs, in practice that isn’t what usually happens. We are seeing as-is contracts come in, the inspection is done, and then there is a second round of negations. Remember, the as-is contract gives an unconditional right for the buyer to cancel during the inspection period but they don’t have to give a reason why they want to cancel. Their “inspection” doesn’t even require them to do what we would call a normal home inspection. In fact, the buyer can cancel at their sole discretion without providing any reason during the inspection period. The standard contract requires an inspection be performed by a home inspector. It also specifies repair limits to cover issues found in home inspection, wood destroying organism or “Termite” report, and the cost to close open permits. By default, these are set at 1.5% of the purchase price. After all, we don’t want to give the buyer a blank check. Bring those repair limits down to a more reasonable level will cover minor items like a leaking pipe, faulty ground fault or other minor issues that you might not even be aware of. As the seller, you also have the option, should requested repairs exceed the amount in the contract, to fix those and continue to bind the buyer to the contract. Unlike the as-is, there is inspection 'period' but no requirement for what kind and what constitutes an inspection. The buyer can cancel for any reason and they are not required to give you that reason. So things like cold feet, a daughter getting married, or the ran out of sugar will work. We sometimes refer to this as the buyer "Houdini Clause." does not relieve Seller's obligation to comply with Paragraph 10(j). This Standard X shall survive Closing. It is good that there essentially is no avenue for a potential claim to come back onto the seller from the buyer for something found later. Of course, if the "something" can be shown it was intentionally hidden by the seller, as-is won't change a thing. You can still be held responsible under failing to disclose. So if you can't hide something known, and you can't be held responsible for items you don't know about, you should be in the clear. 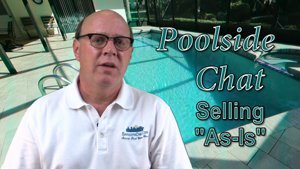 If you intentionally fail to disclose something you know, the as-is probably isn't any benefit to you, the seller. So what is the push to sell a home as-is? We believe the other relieved party, the real estate licensee, is why many of the large brokerages push to have all their agents use the as-is contract. These firms typically are hiring new agents right out of real estate school so the opportunity for mistakes is quite a bit higher and as such, a higher opportunity to get sued because of the actions of an unskilled, unexperienced new agent can cause. After all, it is not unusual to see 100 or more new agents come into our market each and every month! Regardless of the direction you choose, Florida requires disclosure all KNOWN defects. So if your home goes under contract and you are handed an inspection report from the buyer with things you didn’t know about. Guess what. Now you know some new things that you will have to disclose to the NEXT buyer should you not work them out. If you disagree with the inspection report and you on using the as-is contract, if the buyer walks you have no recourse. The standard contract has a provision allowing you, the seller to have the item you disagree with inspected by another inspector of your choosing. If there is a different result from the original inspection, the buyer and you can split a third, tie breaker inspection. Unless the buyer used addendum "L" (Right to cancel), you can still hold your buyer's feet to the contract. Every situation is different so there is not right, wrong or better – one size fits all approach. If you have questions, call your REALTOR or attorney as this should not be taken as legal advice. If there anything I can help with, feel free to call John Woodward at 941-922-8400.